‘Zelmira’ produces large, luscious pinky-apricot blooms with colourful chartreuse and yellow throats. 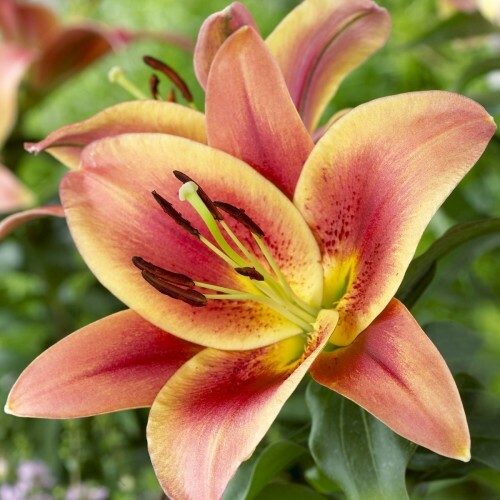 This hybrid of Oriental and Trumpet Lilies will provide you with a tower of flowers in mid to late summer and an intoxicating spicy fragrance. Plant some magic with this Lily! Silky orange and yellow petals with a spicy fragrance - Zelmira will wow you! These lilies have been created by combining the unique features of both the Oriental and Trumpet lilies. The results are nothing less than spectacular and guarantee you get the best of both: strong fragrance, magnificent colours and impressive size - both bloom and entire plant height! In fact, these hybrids will get taller and sturdier with each passing season sometimes reaching heights over 8 ft - 2.5 m! They make a excellent cut flowers and when planted in groups, their fragrance can fill the garden. Since they can grow to be so very tall we suggest planting them somewhere in the garden where they can be protected from strong winds. Plant them 12 in - 30 cm apart in a rather heavy soil with an ample supply of humus and good drainage. Remove faded flowers and do not cut back stems until autumn. Bulbs should not be lifted but left in the soil to bloom annually for many years.